’Nduja, a devilishly hot sausage paste of sorts, seems perfect for these nose-to-tail times. The name of this famous Calabrian pork product comes from the French andouille, and it’s made primarily from meat from the head of the pig (but not the jowls, which traditionally go to the guanciale maker), along with a little skin, some fatback, various trimmings, and a heaping helping of fiery Calabrian chiles. 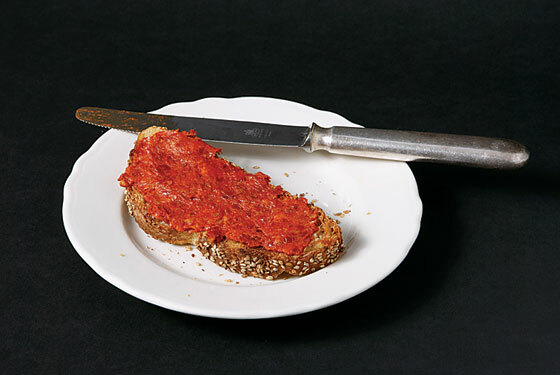 The thing to do with ’nduja is to smear it all over a slice of grilled bread or toast with a drizzle of olive oil. You’ll find it served this way at Jody Williams’s Gottino, and at the new Hudson Square café 1 Dominick, where it’s mingled with calamari and black olives and served as a toothsome bruschetta. It’s also delicious mixed with ricotta, stirred into tomato sauce, or dabbed onto a pizza, as they do at the Marco Polo pizzeria in Carroll Gardens. Look for ’nduja in limited supplies at BuonItalia at Chelsea Market (75 Ninth Ave., nr. 15th St.) for $18.95 a pound—not as bad as it seems, when you consider that a little of this incendiary salami goes a long way.